Nicolas Cage is a great actor! Most of my friends know that I didn't like Nicolas Cage. The reason is simple: he is nephew of Francis Ford Coppola and I had the legitimate impression that he was pushed (sometimes against his own will) into acting and especially into action roles where he really didn't fit well. He simply doesn't look like Bruce Willis or Jason Statham. What he really looks like is the role I recently watched him in: "Adaptation.". I know the movie is 10 years old but I just had the chance to watch it. 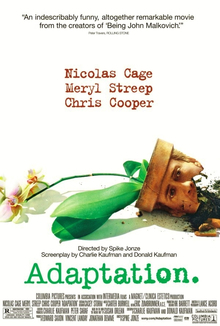 Nicolas was challenged with a double role here. He played two brothers who are quite different but share a common profession: screenwriter. And while the role of the "normal" brother is not really the one Mr. Cage could shine in, the director (Spike Jonze) wisely focused on the other one. I feel sometimes, I am generally too critical in terms of acting performances and there are really not a lot of cases where the actor could catch me and touch my soul. Nicolas Cage did it in this movie. I don't think there is even one person on this planet who could have done this job better. His performance was simply incredible and I finally join the majority of people thinking about him as a great actor. Just don't show me your muscles anymore, Nicolas! The 28-70mm range is considered by many professional photographers to be the most widely used one on a 35mm film or sensor. Therefore it is not a big surprise that most manufacturers offer lenses in this range for the professionals as well as for the beginners. Third party companies are not an exception to this rule. Angenieux is a French firm well known for their high quality motion camera lenses as well as for some important innovations in the optics. In the 1990-ies it tried to enter the photography marked by offering some very interesting lenses for the main camera body manufacturers: Nikon and Canon. Unfortunately they did not see a future for their efforts and discontinued the production line focusing on motion camera lenses only. The AF Angenieux 28-70mm f/2.6 was one of the most anticipated Angenieux products but only some 3000 F-mount lenses were produced. I was told that Nikon delivered the electronics for these lenses, so no reverse engineering was necessary on the Angenieux side. However I was not able to find any confirmation to this online. Noticeably, the lens has a constant opening aperture at f/2.6 but this is not registered by the two Nikons I tested it on which showed f/2.8 instead. Even today, using digital equipment, some customers continue to report superb image quality delivered by the Angenieux 28-70mm and some consider it even better than the Nikon flagship lens in this range: Nikkor AF-S 28-70mm f/2.8D ("The Beast"). This was the reason I decided to buy an Angenieux and am fortunate to have a very well preserved one now. Soon after I started taking pictures with the lens, I noticed that it delivers somewhat "softy" pictures. I decided to buy The Beast and do this test. For some years now we have a multiseat system based on Ubuntu (since it was initially very easy to set on). Moving to a new apartment made us think about how to place the furniture and most important the working desk (with the two workstations) as well as the speaker boxes. Until now the (Class A, SET vacuum tube) amplifier and the (also vacuum tube) DAC were on the desk with the speaker boxes placed on the two sides of the working table. However, in the new apartment we decided to place the working desk in a corner. This brought up the question where to place the speakers. We decided to put them on a remote wall of the room. The problem was now how to control the sound from the common machine (client). Bumper-sticker slogan of the supporters of the National Rifle Association (NRA) is "Guns don't kill people, people kill people." Let's put aside the fact that the NRA is a conglomerate of the stupidity and rusticity elite of the USA. I was always surprised how can one present himself as a "big" guy just because he owns guns and shoots with them. How cunty it is to pull a trigger and claim masculinity out of it?! Most of those pussies are too weak to go for a real fight... the one with the fists. This is a report about a girl who died because it was accidentally shot. In the last year this is the third kid in South Carolina donating its organs because people have an unjustified easy access to guns. Only in about every second case (of all possible ones) organs are donated. The possible donors are only the ones shot in the head, not calculating the chest (heart, lungs) injuries which are incompatible with life. This makes the real number of the killed innocent kids at least twice as much. And South Carolina has less population than Brooklyn and Queens in New York. 1. Woody Allen uses always the same font for the credits in his movies. 2. In his recent movies he started presenting more a segment of a story than the whole one. The reports and pictures about the situation in Japan dominated the media in the last week surpassing even the (possible) genocide in Libya. We were able to see horrible pictures of devastation as well as to witness the dignity the Japanese people are facing the tragedy with. Still, to me the most stunning aspect of the situation is something else. I could understand some price differences in offering different qualities on a carrier (e.g. CD vs. DVD-A). But I definitely can not understand why I don't have the opportunity to buy the highest available quality. Studio recordings are done in 24bit/192kHz and not in 16bit/44kHz. The difference is as audible as it is between mp3 (even at 320kbit/s) and 16bit/44kHz (CD quality) when you have equipment used to be called audiophile but easily available nowadays. As long as 24bit/96kHz recordings are offered for $80 per album (see SACD and DVD-A prices), I will refuse to buy them. And I am not sure that this is the goal of the music industry. It is just that greed and stupidity run hand by hand. Unfortunately the discussion about higher quality recordings is far from getting relevance, as we know that the most successful online music store price a song at $1. (On top of that they put also some restrictions on how you should use it.) At this price you could get a CD with CD-quality sound, carrier and a booklet. Still, this music store is so successful that the music stores almost disappeared from the streets. The lead article in the last "The Economist" is about China's economy. While you read it, you might ask yourself if there are any original ideas by the Chinese Communist Party that sustained. We all know that the development of the (meanwhile second largest) world economy is done by exploiting workers. Paradoxically this is what communists used to recruit supporters in the past... worldwide. Electronic devices for reading long text files (e.g. eBooks) have become very fashionable in the last couple of years. One could wonder what changed for this to happen. After all flat screens have been around for some decades now. Portable flat screens also! Optimized for: Firefox and Google Chrome! | Powered by a custom CMS named "minb-zer0", the zero calories CMS! | HTML5 and CSS3 valid code as of the last check by W3C.